A couple of weeks ago, I found myself sulking outside of a local bakery. 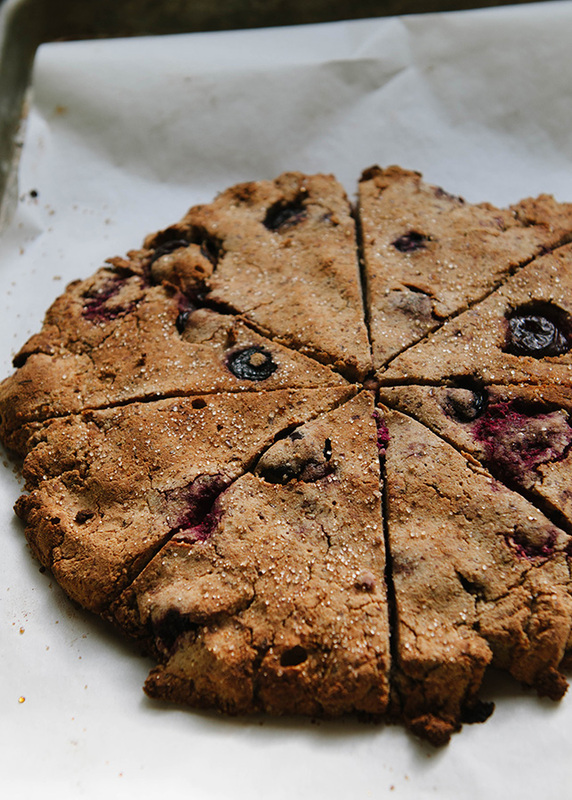 This isn’t a gluten-free bakery, but they do make a fantastic gluten-free scone. I arrived too late in the day, and as usual, they were completely sold out. However, my wheat-eating husband bought himself some ridiculous looking apple-stuffed, almond-stuffed, hopes and dreams-stuffed croissant. I was irrationally upset about this situation. I could feel my blood pressure rising as I watched bits of pastry flake off onto his shirt, and tiny bits of apple adhere to his adorable mouth corners. All I wanted was a scone. I briefly considered not eating breakfast at all. How could I? I had been dreaming of that scone for… well, at least the last thirty minutes. I could taste the flaky bits of berry filled dough in my mind. No other breakfast would measure up. I was on a scone only hunger strike. I was quickly becoming an insane person. This happens when hunger sets in. I’m still myself, but the drama is cranked up to eleven, and the tears start to nag at my ducts, begging to be released. It’s as if I’ve melded my physical person with the frenetic emotional instability of Buster Bluth, and the overly emotive face of Oscar The Grouch. If you’re wondering, my husband really loves when this happens (he doesn’t). May I remind you that all of this is happening OVER A SCONE. Ugh. I’m sure I eventually ate that day. But, I carried my scone craving with me for days to follow. You know how it is. You get an idea of something you’d like to put in your face, and then your mind just obsesses over it until it’s yours? You don’t do this? You don’t get weirdly obsessed over scones or brownies or a particular kind of smoothie? You’re better than me. So, this went on for three days. Me craving scone. Me not getting scone. Me being grumpy about said scone debacle. Oh, and then I had this brilliant epiphany. I’M A FOOD BLOGGER. Making gluten-free scones is my business. I could even take it one step further and make them grain-free. Does anyone want to do a face palm for me right about now? I get it. Me too. I took the flavors of the berry scone that I was craving and decided to amp it up a little with the addition of ginger. I also happened to have a blend of frozen berries that included cherries sitting in my freezer. YUP. Don’t have to ask me twice. Consider it done. 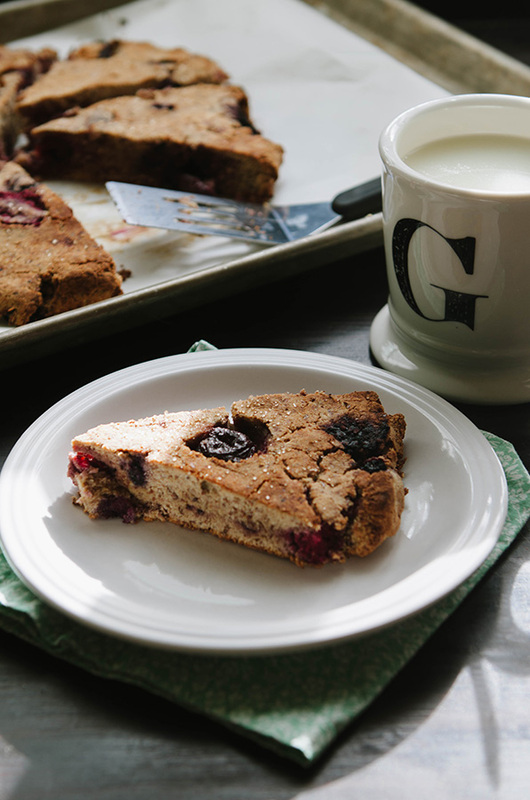 And, just like that… from three days of grumpy scone lust, to thirty minutes of solid scone-making innovation, these grain-free babies were born. It might have taken me a ridiculous amount of time to get my scone fix, but gosh dangit, we did it. I think this is the part where we all come together and sing songs of joy and hope and sconepiration. Maybe around a campfire. Maybe just silently to ourselves. Maybe not at all. Either way, SCONES. Now, if we could just have a moment of silence as I try to fish the final scone-y crumbs out of my bra. Thank you. You’re the best. Combine the almond meal, flax meal, coconut flour, salt, ginger, cloves, nutmeg, cinnamon and baking powder into a large mixing bowl. Stir together until it is well combined. Work the cold coconut oil into the mixture using clean hands. This should make a crumbly dough mixture. Add the coconut sugar to the crumbly mixture and stir together. Add the coconut milk and stir until it is completely absorbed and combined well. It will start to ball up into a more workable dough. Gently fold in the frozen cherry berry blend, taking care not to stir too hard and break open all of the berries and cherries. Once the fruit has been folded in, create a ball out of the dough and place it into the middle of the parchment lined baking sheet. Use your hands to flatten the dough into an even disc. It should be about 10-12 inches in diameter and an inch or so in thickness. Using a knife, cut the disc into eight even pieces. Sprinkle the tops with a bit of turbinado sugar. This step is optional, but it gives the scones a night sweet crunch on top. Bake for 18-22 minutes, or until the scones are a golden brown on the outside and crumbly on the inside. Remove from the oven and allow to cool for several minutes. 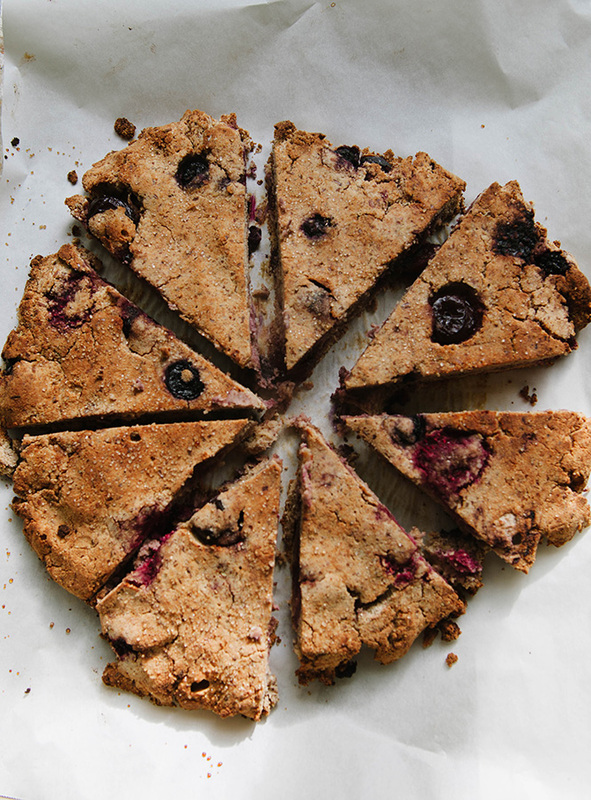 Once they've had some time to cool, pull the cut segments apart into individual scones. Serve and enjoy! I’ll have to try the recipe. I love a grain free…anything! Also, a full cup of coconut flour and no eggs really makes me want to see how they turn out! After reading your post, I now want scones. I think these will be in our near future. Yum!